A huge part of lead management is experimenting with many different techniques, analyzing what works and fixing what doesn’t work. In order to do that, you and your SDRs need to set realistic expectations and understand that sometimes sales efforts don’t go as planned. 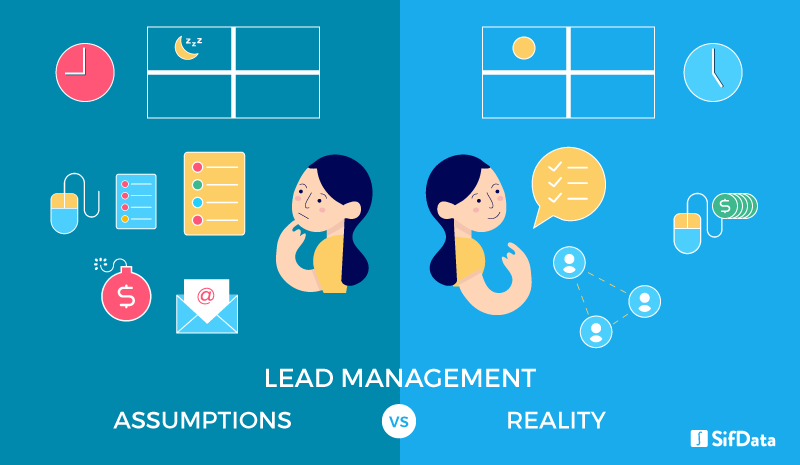 What we aim to do in this blog is show you some of the common misconceptions with lead management and how you can fix them to gather and convert more leads. PPC is one of the most promising platforms for salespeople and marketers alike to collect hundreds of emails, phone number, and other valuable information for SDRs. But it only works if you set realistic expectations. Your marketing team is spending an excessive amount of money per click and all your SDRs are getting are hundreds of people that aren’t sure exactly what they entered their email for. Now your salespeople are wasting precious hours on sales leads that most likely won’t end up converting. What can you do to make sure each of your leads are actually interested? The most important component of a high-converting PPC campaign isn’t your bid or CPC…it’s your landing page and lead-capture form. Without a convincing landing page that communicates exactly what your product/service is about and how it can help your target audience, most PPC campaigns are going to fizzle out. Make sure your PPC ad aligns with the content that you are offering on the landing page. Try out Instapage for a great landing page building platform that doesn't take a web developer to figure out. Automation is the big word in sales development these days. You can automate lead scoring with Drift, lead distribution with LeadAssign or key contact information with SifData. Generating intelligence about your leads and target customer, scoring and nurturing those leads, and then finally converting them is a hugely labor-intensive task. Lead management automation promises to make your job as a sales manager easier by giving your SDRs all of the information they need before working on sales. But automation only works if you know what to expect beforehand. The reality is...no matter how streamlined your lead management process is, your sales team will still find themselves doing most of the leg work in maintaining and converting high-quality leads. This doesn’t mean that they aren’t being productive…it just means the are spending more effort on higher quality leads they know will convert. Allow your SDRs to focus on important lead management tasks like personalized outreach, and providing real value to their leads through demos and relevant content. Once those automated lead management tasks are taken care of… you can let your SDRs do what they do best, convert. Every sales manager knows that one of the most important parts of building a successful sales campaign is tracking metrics from previous campaigns and building on them. Tracking, evaluating, and scoring all of your sales leads is crucial to improving your workflow and making sure your team is as effective as possible. But what do you do with all of the data once it’s collected by your sales team? The reality is…data is one of the most underutilized resources available to businesses today. And there’s a reason for that, it’s tough to make sense of it. One of the biggest challenges with lead management is making sense of the mountains of sales data that’s put in front of you. Your SDRs can collect as much data as they want, but it won’t mean anything if you don’t know how to analyze that data and make improvements. So, what’s the best way to gather data and use it to sell better? Designating a single team member to analyzing and presenting data for your sales team can be one of the most simple ways to start utilizing data. Look for employees that are experts in data analytics platforms like Tableau, Python, and Mode Analytics that can help make presenting data to your sales team not so daunting. If your company doesn’t have resources for a designated data analytics employee, then most sales CRMs like Salesforce and Hubspot have many apps that make it relatively easy such as: Einstein Analytics, Hubspot Sales Reporting Add-On and Tableau. Understanding these 3 common misconceptions with lead management relating to PPC, automation and data tracking can help you get over a plateau and increase your sales productivity. Get more qualified leads from PPC by make sure your company’s ad aligns with the content that on the destination landing page. Stay focused on important lead management tasks like personalized outreach and automating few tasks like lead nurturing, lead scoring and lead distribution. Make data actionable by integrate data analytics apps with your CRM to help your sales team make sense of the loads of incoming data. Track when your key sales leads move to other companies. SifData is an essential Salesforce plugin that helps reduce churn and retrieve lost leads by tracking when your key contacts change jobs. Learn more at sifdata.com or download our software from Salesforce AppExchange today. Date- Feb. 20, 2019, 8:35 p.m.